03:46 — Doctor Who: 2015 soundtrack to be released in 2018. 05:28 — Dirk Gently: BBC America pull the plug. 09:52 — Star Wars: Fan film recreation of A New Hope Lightsabre battle. 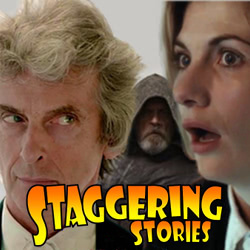 11:54 – Doctor Who: Twice Upon a Time. 41:11 – Star Wars: The Last Jedi. 80:25 – Farewell for this podcast! 80:59 — End theme, disclaimer, copyright, etc. Wikipedia: Star Wars – The Last Jedi. 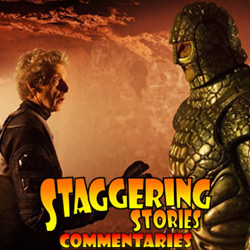 Adam J Purcell, Andy Simpkins and Keith Dunn sit down, awakening, in front of the 2017 Doctor Who S10 episode, ‘Empress of Mars’, and spout our usual nonsense! BBC: Doctor Who – Empress of Mars. 02:49 — Star Trek: Tarantino may save the film series. 05:09 — Scooby Doo: Velma and Daphne prequel film. 07:31 — Stranger Things and Game of Thrones: No shows for 2018. 08:00 — Doctor Who: Dr. Men vinyl figures. 11:06 — Pacific Rim: Sequel due out in 2018. 12:01 — Comic-con: Trade mark dispute. 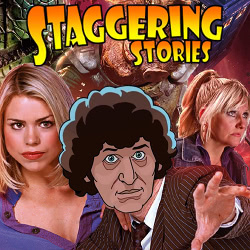 19:44 – Doctor Who: Jean’s BFI Shada experiences. 26:53 – Game: Doctor Who – Name That Scream! 35:52 – Doctor Who: The Tenth Doctor Adventures, Vol. 2 (Big Finish). 64:47 – Game: Doctor Who Job Interviews. 70:44 – Emails and listener feedback. 70:57 – Farewell for this podcast! 72:27 — End theme, disclaimer, copyright, etc. Adam J Purcell, Andy Simpkins and Keith Dunn sit down, detecting, in front of the Season 5 Babylon 5 episode ‘Movements of Fire and Shadow’, and spout our usual nonsense! The Lurker’s Guide to Babylon 5: Movements of Fire and Shadow. Wikipedia: Babylon 5 – Movements of Fire and Shadow.